Lisa Hulber didn’t think twice when the results of her mammogram came back negative for breast cancer. After all, her doctors hadn’t detected the presence of any tumors. Effie and her owner Lisa Hulber. 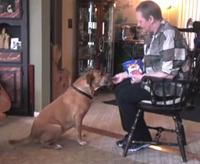 But Hulber’s dog, a rescued Hound mix named Effie, disagreed with the doctors. It seems Effie could sense that something was wrong; she sniffed her owner to the point that Hulber decided to seek another opinion, and on that second doctor’s visit, Hulber found out that she did indeed have breast cancer. The doctors performed an excisional biopsy to remove the tumor, and when Hulber went home to recover, Effie’s diagnostic sniffer was at it again. Since Effie’s diagnosis, Hulber underwent a double mastectomy and a 20-week round of chemotherapy. She will begin radiation treatments soon. Hulber says that this is not the first time that Effie has detected the presence of cancer; Effie was the first to know when the family’s kitten came down with the disease. Hulber first rescued Effie as a volunteer for Last Day Dog Rescue in Livonia, Michigan. Hulber, a foster parent for the organization, fostered Effie and her seven puppies. After finding forever homes for the pups she decided to adopt Effie, and it turned out to be a lifesaving decision for them both.